Thefts from vehicles is the number one crime happening in your Community. crime is reduced in your community. Never Never Never leave ANYTHING on display when you leave your vehicle. Even loose change, cigarettes, cigarette lighters, sunglasses, CDs, cell phones, stereos, cameras, and clothing, if they can see it they will steal it. Placing items in the glove box or under the seat helps but many thieves will check these areas even if they just think you are hiding items. If you carry these or other items in your car, place them in a small gym type bag and lock them in the trunk of your vehicle when you park it. Then when you come back to your vehicle remove your gym bag from the trunk and your items will be available to you. All parcels and shopping bags should be locked in the trunk of your vehicle. Many of the newer cars have trunk releases in them; lock the truck release when you park your car. 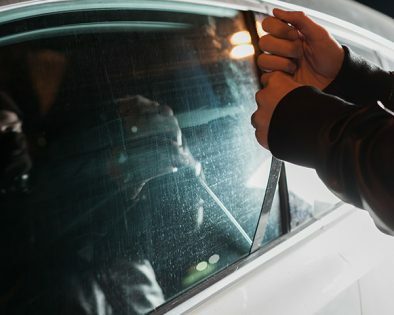 Thieves will break a window in your car, press the trunk release and now they have everything in your trunk. When parking at home, always use your garage if you have one, and lock both your vehicle and your garage. If you don’t have a garage, try to park in a well-lit, open place. When parking at work or your local mall, park in a well-lit open place. Removing stereo face plates and locking them in the trunk or taking them with you, will deter thieves. Alarms can deter thieves not only from stealing items from your vehicle, but also from stealing your vehicle. Even if you have an alarm installed NEVER, NEVER, NEVER leave anything in your vehicle. Thieves can smash a window, reach in grab an item and be gone in seconds, before your alarm is even activated. Caution is needed that you do not set your alarm to sensitive. Storms, wind, large trucks passing by your vehicle can set it off. Use a steering wheel lock every time you leave your vehicle. A vehicle that is well secured has a tendency to deter criminals. A steering wheel lock will also deter theft of your vehicle.